For years, IDA has been telling you about the elephant Nosey: carted around from one small circus to another, suffering from a terrible skin condition, losing weight, fed poorly, and regularly in dangerous contact with the public. We have been diligently monitoring her, with your help, and have filed multiple complaints with the USDA for violations of the Animal Welfare Act. The USDA has just announced that formal charges have been filed against Nosey's exhibitor, Hugo Liebel, for multiple violations of the Animal Welfare Act involving inhumane treatment and dangerous handling of Nosey, and a spider monkey named Reggie. The USDA charges include repeated noncompliance with federal requirements for veterinary care, handling, and housing from 2007 through 2011. The charges specifically cite failure to provide veterinary care for Nosey's chronic skin condition and weight loss, chaining Nosey so tightly that she could not move, and handling her in a way that was dangerous to the public. 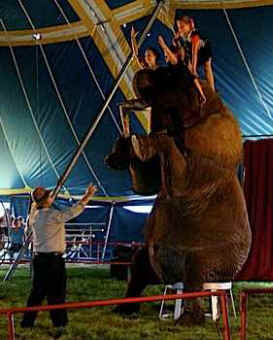 This can result in significant fines, and in the suspension or revocation of Liebel's license to exhibit animals, giving us reason to hope that Nosey's life will soon improve. Thank you for responding to our appeals about Nosey - this is yet another example that your letters, e-mails, and phone calls do work.